These notes apply to any ocean, but we will use specific examples for west coast of Vancouver Island, BC for those following the OAR NW expedition, which has reached Port Hardy now at the top of the island, waiting for a good weather window to head south on the ocean side. There are several ways to learn about actual ocean winds (as opposed to forecasted winds, which I will address later). In some cases there are buoys offshore that report winds back on a regular basis. In our example there are 3 of them. The red dots at the EC marine weather page. There are also 4 land based stations along the coast on the same link. We can also learn the winds from the ASCAT instrument on the satellite MetOP-A that provides data in this region several times a day as it passes overhead. 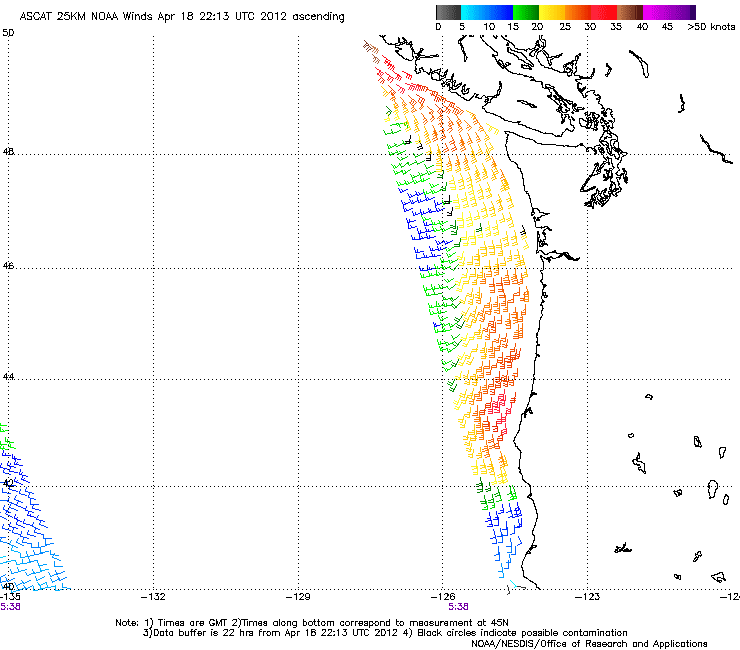 Read this data from the Ocean Surface Winds Team website. This is wonderful data, actual measurements, not predictions, but there are some nuances to using it. Again, these are ways to see the actual wind. Later we will add some notes on forecasted winds. With a clear view of the sky, GPS can usually give us a fix within 20 or 30 yards, even without a WAAS satellite locked in. But on a long trip along coasts, in and out of narrow passages, the accuracy can vary depending on how much of the sky is showing. Often we do not pay attention to this detail, but it is printed out on the GPS display in some form giving reliability, usually in terms of feet. The OAR NW team decided to pull into Snug Harbor for some repairs they discovered needing after getting under way. You can see info on the start at www.oarnorthwest.com. The track shown there is from their Yellowbrick transmitter, a slick device that relays back their position, COG and SOG, and brief text messages every 15 minutes by txt msg to a cell phone at home base. They apparently decided to check out this system by keeping it on at a fixed location overnight to see what the spread in positions might look like. I added the scale to the picture. Each tick mark is 10 yards. Red rings are at 20, 60 and 170 yds. These are fixes every 15 minutes. We see that most of the signals are within 20 yards, as expected. There are outliers, but even these are mostly within 60 yds. We see just one rather far out at 170 yds. This is strong testimony for this device because the unit had only some 10% of the usable sky to see through two large windows. The main message is, if we subsequently see the boat on land as it traverses a narrow channel we should not panic. Wait another 15 min to see if this was just one of these fixes from the far wings of the statistical distribution of fixes. In narrow passes and along steep cliffs, or back packing with your Yellowbrick, you have GDOP to deal with (geometric dilution of position). Position accuracy depends on the geometry of the satellites in view. It is the same issue of getting a bearing fix from two land marks next to each other. Fixes are best when the targets (or satellites in this case) are more spread around the horizon. On a hotel balcony, or walking or rowing along the side of a steep cliff, notably less than half the sky is visible, which might limit your accuracy. A good way to check this when in doubt is refer to the satellite display on the GPS unit. There is usually one in the set up menu. It will look some thing the following. It is a radar like display. The center is overhead in the sky, the circumference is the horizon. North is usually at the top of the page.A satellite located about half way out at 3 o'clock would be 45 deg high bearing due east. Here is a sample of a good distribution (but normally there would be more satellites... i just found this pic online). And here is one from my Garmin 301 looking out a window. It does not give a strong fix in these conditions, but even a weak fix these days is pretty good. Generally the unit will just say tracking or can't find a fix if this gets this bad. We see satellite 09 (about 15 deg high) and 27 (about 30 deg high) are the strongest, but they are both in the same NW direction. It has locked on to 11, but the signal is weak. Note that is knows where the others are, but it cannot connect to them. When there is only two satellites in about the same direction the fix will not be as good. Knowing this does not give you a solution, but just an understanding of the limits involved. 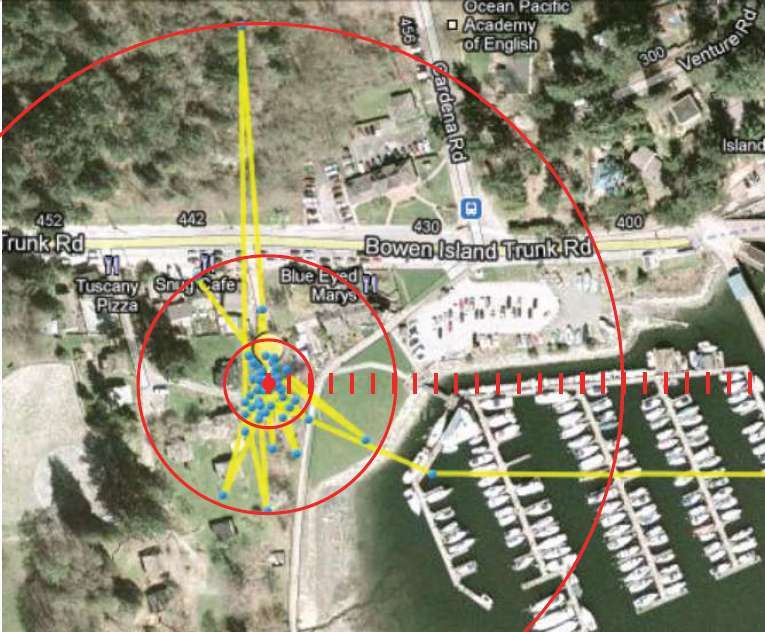 You might learn, however, that if you just move another few feet (on land to get away from a building) or another quarter mile on the water to get past a bluff, then you would have access to the satellites that you can tell from this picture are being blocked. It also does a good job of locating the com port with GPS signals as well as showing a hyper terminal type display of the incoming signals (again, most ECS programs have such a utility, but we have still found this tool useful. The instructions imply it has to be installed, but they must refer to a version that they ship with their GPS units. This link brings a 100-kb, stand-alone file that runs as is, no install, no interactions with your registry. Just realized we have not tested to see if this works on 64-bit. Will try tomorrow. 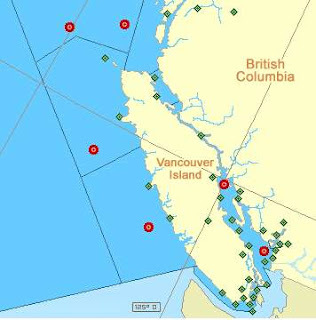 For a long trip though a complex waterway such as a trip up the inside passage to Alaska or around Vancouver Island, the tidal current flow can dominate the navigation planning. Such planning is most easily done on echarts. One would think that echarts themselves would have all the current stations clearly marked, but that does not seem to be the case, at least on the charts that I have. Some charts show current arrows at the location of the station, and the Canadian charts do periodically show an A inside a diamond at the location of some stations, but there are many more without any notation. On the other hand, some echart programs themselves impose the current station location on the chart if they include a tidal current display option. If you have one of these, you may not need this exercise, unless you have a mobile device that does not show them. But it is well worth testing. There are three sets of current data for the waters around Vancouver island. One from Canada and it appears there are two sets from NOAA, or at least the NOAA list online is not the same as the list in the US Current Tables. Also we have have found that several, maybe most, US eachart programs only shown the US stations, which might be traced to the copyrights on the Canadian data. I am not sure. 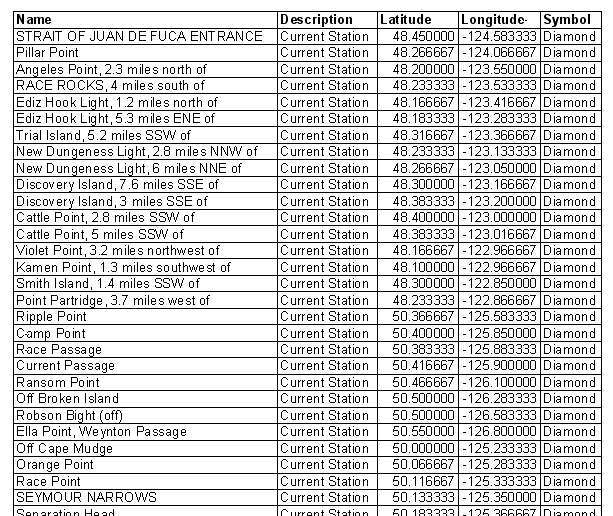 In any event, we wanted to be sure we have all stations available for the upcoming rowing expedition, so we made this list. And it has been very instructive. A couple notes follow the procedure. So we set about figuring a way to do this, which is outlined here. Step 1. Find or make a thorough list of the stations available, which we found we needed to make from digital lists of the US stations and then manually entering the Canadian data from their tables Volume 5 and Volume 6. We did not include adjacent channels that were not going to be covered. 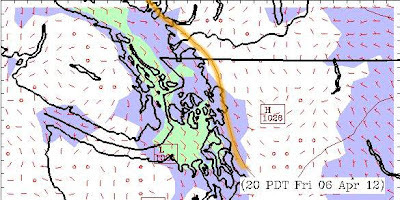 For the round Vancouver Island we used this relay link http://www.starpath.com/resources2/tidal_currents_Inside_Passage.htm, for the NOAA CO-OP stations, which we list on this page http://www.starpath.com/resources2/can_wx.htm -- a weather page we set up for our onboard training trips along the inside passage and have recently revitalized for the OAR NW rowing expedition around Vancouver island. Then we added to these the US stations not on that list directly from the US Current Tables, and then added the Canadian stations. In some cases they overlap with exact coordinates with a US station, in other cases they have similar ones, but rather separated. Step 2. This step is easier if you have some practice with spread sheets. In fact, i would have to say that this whole exercise requires these excel or equivalent basics, because we have to paste that list of stations into excel, then delete all the columns except lat, lon, and name. But then the lat lon will be in degrees and minutes, so we have to make this into decimal degrees dd.dd = (dd)+(mm/60), then we have to multiply the lon by -1 since the gpx convention is West Lon is minus. We want to end up with something like this. 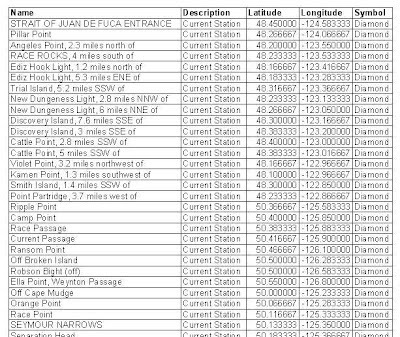 Then save this file in the format .csv called something like current_stations.csv.... or just keep it as an xls file. In this last updated set we found that Step 3 works with xls or csv files. Step 3. Then comes the magic step, compliments of a website called gpsvisualizer. 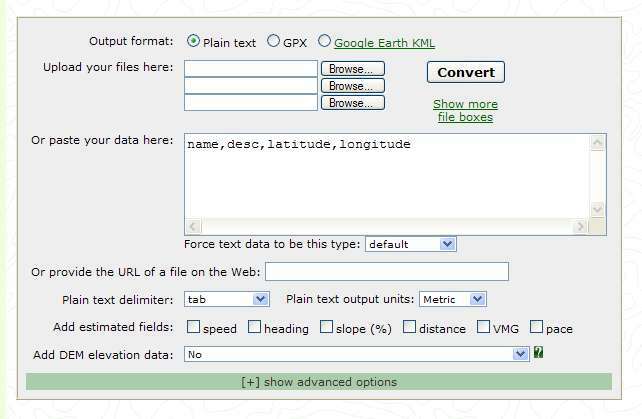 It is a complex site, but the punch line is go to this part: http://www.gpsvisualizer.com/convert_input which will show you an input page that looks like this (from a link at the top of the page that says "convert a file". Put a check in the gpx output, then navigate to your current_stations.csv file and push the Convert button and save your gpx file. This file can then be imported into your favorite echart program and you have all current stations plotted. This set of current station waypoints right on your echart can be very handy underway as you know then where the closest place is that has data. These are not magic waypoints, however. They will not tell you the current themselves, but if you have an echart program that lets you right click and show currents, these points show where the stations are they refer to. Or you look up the data the old fashioned (more dependable!) way called current tables. If you see current waypoints on the echart that are not providing data from your program, then you have to look up those in the tables. Current analysis for route planning can all be done brute force underway as you proceed, but it is usually benificial and efficient to have as much done as possible ahead of time, especially in the tight quarters of a 4-man ocean-going row boat. Some subtlties. The order of the columns in your csv or xls file does not matter for the conversion program we use, but they must have the properly spelled and named headers. You can skip the symbol tag, but if you choose to use a symbol type the name you choose should be a listed option in the echart program you plan to use. Choosing "circle" seems a safe choice, but in the end you will want to change this to something unique or more prominent. Here is a sample of the one we made for the around Vancouver Island route. Many ECS programs use waypoint Descriptions, some such as the Time Zero products from Nobeltec and MaxSea use only Comments. None we have seen accept both, so we had to make two. 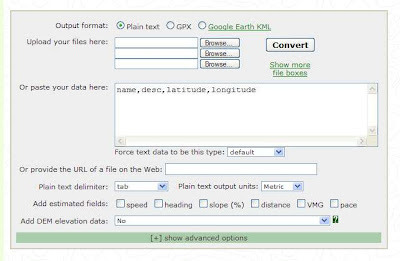 With the same note we have in an earlier post that incldues a set of tentatative waypoints, namely right click and save (or just click it to see what the files look like), and when using Internet Explorer, it might still try to change the extension to xml, in which case just change it back to gpx. 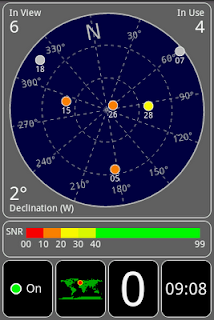 Current Station: CHS / NOAA = 9000 / 1341 means that both agencies have a station at that location and the Canadian number is 9000 and the NOAA number is 1341. Current Station: CHS / NOAA = / 1346 means this is the NOAA station number and there is no Canadian station, and likewise Current Station: CHS / NOAA = 8500 / means there is a Canadian station but no NOAA station. And here is one weird thing I learned, NOAA station numbers always end in a 1 or a 6, and Canadian station numbers end in any digit except a 1 or a 6. This is about the most cooperation we have ever detected since the onset of the Free Trade Agreement. I trust that is not an accident. Another important thing to keep in mind, which is not restricted to this exercise, is that often the official definition of the location of a current station is not always where the actual station is located.Whenever you see the location given to the nearest whole mile it is likely not precise. The station called Current Passage (NW of Helmcken Island) is a good example in this route. The official location given is actually on land. The actual location is somewhere in the middle of Current Passage, below the lat lon given. In some current tables they give both a lat lon and a verbal description (ie 1.4 mi SW of Pt Doda) and in these cases usually the verbal description is more accurate. If you see labeled current arrows on the chart is some logical location near a clearly wrong lat lon description, then chances are the right location is near those printed current arrows. We have some updates added at the end. This was not good condtions for testing. It seems the 12-km data display is a better way to read these predictions, that way we can actually see more of the race course. So here we do it all again. This is from a model initialized at 5 am PDT today, Thursday. 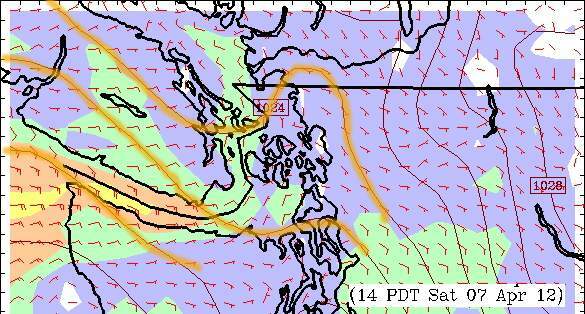 I have highlighted the isobars bounding the race course to show how the winds are developing as they do. 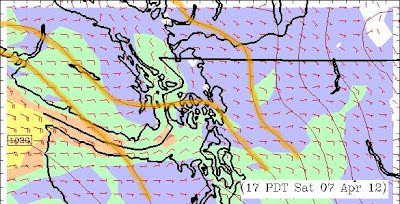 Recall that these isobars from the UW model should be more accurate than the ones we see in a GRIB file of the GFS model that show up on echart programs. These isobars move around a lot in this region as the day heats and cools. Click a picture to open it, then you should be able to roll your mouse to step forward and backward through the predictions. Now that the race is over, or over for most boats, we can look at how the forecasts panned out, and in short they did not. The conditions were just too squirrely. The data are below, but check out Cliff Mass's weather blog current post called "Instability in the skies" to get some insight on why conditions were so hard to forecast. 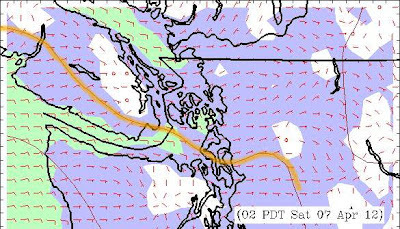 The UW data did actually call for the NW winds Sat afternoon from 3 days out that was not in the early EC forecasts, but still these were very difficult forecasting conditions. Natural Ranges—How accurate are they? A natural range is the alignment of any two objects we see on the waterway. When they are in line, we know we are on the same line. It is an excellent way to see if we are being set by current, or if the objects are actually on the chart, it is the most precise type of line of position we can hope for. The use of navigational ranges (those put there by some agency to help guide us) and natural ranges are discussed in the text book. The human eye is very sensitive to fine alignments, as shown in the figure below. Vena is using her cell phone camera to take a picture of the alignment of two dolphins in the water at the end of the driveway. 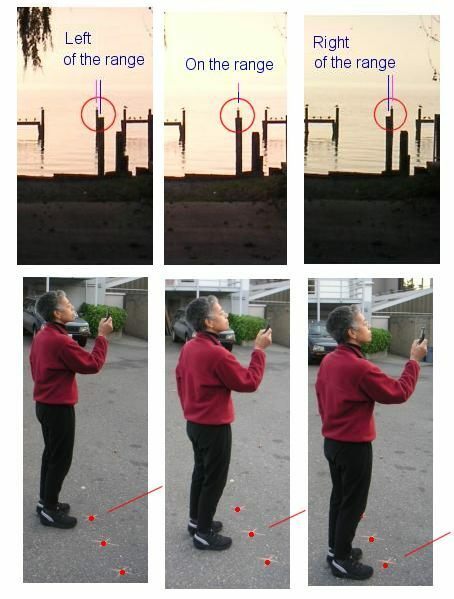 There are three pictures, taken about 18 inches either side of precise alignment. Note that the offset from the range is clearly visible even from this very small offset from the actual range. The location of the exercise is shown below from a Google Earth capture of the location. The pictures were taken from the 3 locations shown marked on the ground in the picture above. She was standing at the location of the circle on the far right. The next circle out is the closest dolphin, and the next is the farthest. This exercise is meant to show how sensitive the eye is for this observation. We can easily put numbers on the angles using the small-angle formula we use throughout our textbook. Namely that a 6-degree right triangle has sides in the ratio of 1 to 10, and the formula scales accurately to as small as you like. Three degrees has sides in proportion of 1 to 20, and 1° would have sides of 1 to 60. 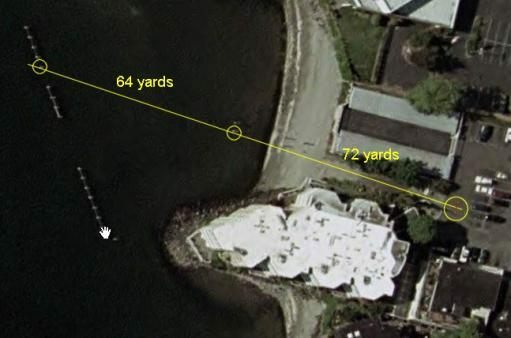 Thus at 64+72 = 134 yards = 402 feet, a 1° angle would correspond to 402/60 = 6.7 feet off the line. We are only stepping about 1.5 feet, so we are seeing an angular offset of way less than 1° — more like (1.5/6.7) or about 0.22° or 13' of angle. So if you do want to estimate how well you can stay on any range, it is likely fair to assume that you can detect an offset of about a quarter of a degree, which would be sides in a ratio of about 1 to 240. Thus if i am on a range with markers about 0.5 miles away, i would easily detect when i have drifted off by about (0.5 x 6000)/240 = 12 feet. Next time you note you are on a nice natural range or navigational entrance range, take a look to your GPS positions to monitor how far off you can be before you detect it. If you are accumulating a trail with the GPS on an echart, then you can see this nicely by just zooming way in as you alter course back and forth across the range—by just a little bit. This exercise would apply to the Southern Straits of Georgia Yacht Race or any other sailing or rowing event in these waters. 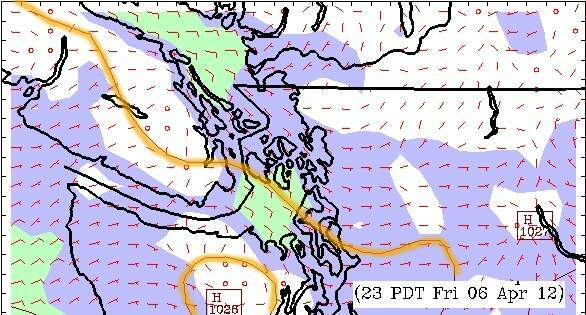 This is a preliminary look at the winds, made at noon on Wed for a race starting Friday morning. We are close enough now (72 hours) to start getting good data The course is 135 nmi. With a SE wind there is one weather leg of 30 nmi which adds another 15, so we are roughly 150 nmi. other wind directions make the race longer. Fast boats in good wind will finish Saturday morning in good condition, but many boats will race throughout Sat as well. This note is intended as a learning process, so you can make similar forecasts on your own. Friday Wind variable 5 to 15 knots. Saturday Wind light becoming easterly 10 to 15 knots. This makes it an absolutely bueautiful practice exercise, because variable means they do not know the direction, and 5 to 15 is essentially the same as 0 to 15 meaning they do not know the speed. Also note that "Str. of Georgia, North of Nanaimo" zone goes all the way north to Cape Mudge, so the race takes place only in the southern half of this northern zone. But they do have a clear trend forecasted, going easterly 10 to 15 on sat, but they do not say what time sat. 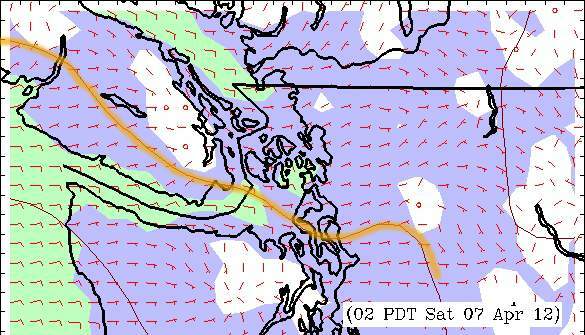 A fast boat will be done early sat, daylight or so in good wind, definitely later in the day if light air. Our job now is to see if we can do any better. Maybe yes, maybe no, but we do not know yet. 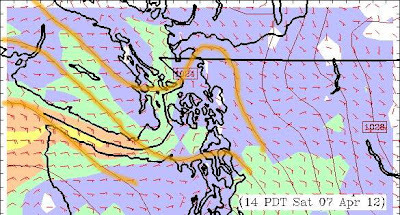 We rely on the model calculations from UW Atmospheric Science dept, from the team of Cliff Mass, whose weather blog we link to here on the side. It is a great source of local weather and much general information as well. Then stepping through you can see the predictions for wind in the Georgia Basin. We have cut out and pasted the region of the race course. 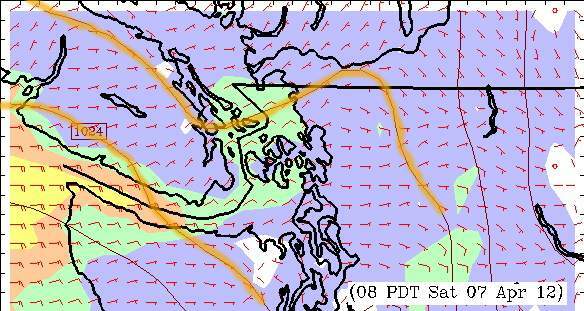 Then I have read the map west of Vancouver to get the wind predictions marked in blue. In principle, we could get a nice summary of these observations from the meteograms of the same data. These only go out 72 hr, so we do not see the race yet. Here we can only see the hour just before the maps above, which for the center of the region is about right. 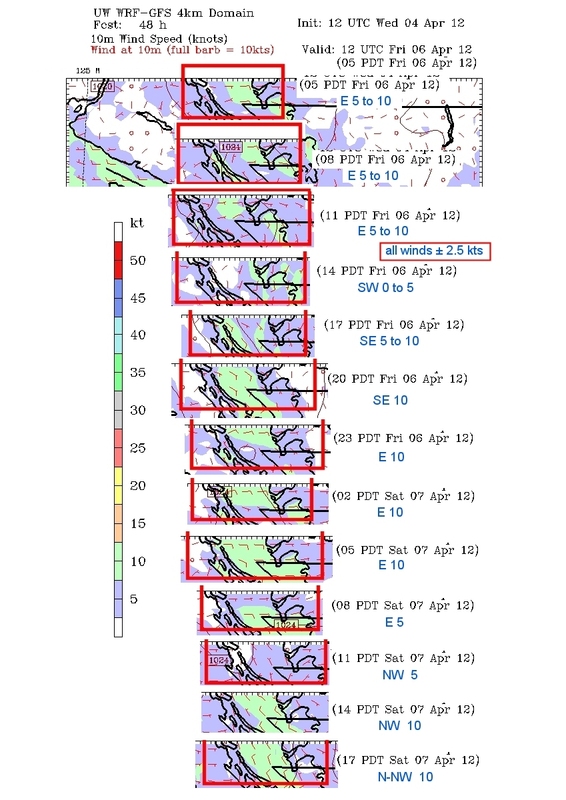 Once you are sure the meteograms are doing the job of depicting the maps, and you get closer to race time, you can print a meteogram for key points in the course, such as Pt Atkinson, Halibut Bank, Balennas and Entrance Island and in principle have a nice forcast. Then of course listen to the reports when underway. The Canadian Marine Weather Guide tells where you have reports. In principle once you get close to live times, the local VHF radio weather should be pretty close. To my knowledge, this procedure here would be the best way to make your own forecast. In this example we see slight variations in the details over the EC forecasts, ie we see a prediction for going NW later on Sat, but the wed forecasts from EC predicts only E on Sat. 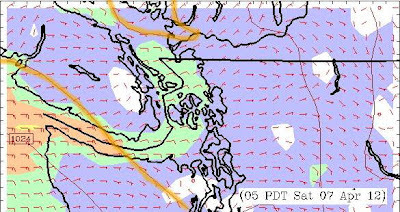 We also see that these predictions go easterly 11pm Fri night, so we do not have to guess when on Sat will they go east. We still have to guess this is right, but you start out with more specific guesses, which are in fact based on the best science for such predictions that is available and we are grateful for the good work of the UW meteorology dept in providing these. On race day one could switch to this source of data which has higher resolution. 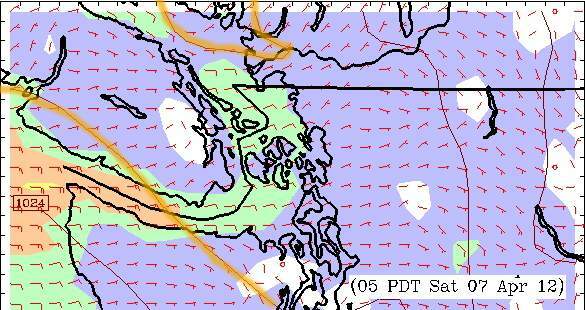 Go to the UW models link above, but then selection 1.33-km Surface winds for Northern Waters. This will be higher resolution data on a larger scale chart, but it only goes out 6 hr.